For some people, it is easy to be comfortable in a room full of strangers, while for others it can turn out to be a nightmare. Thus, if you are looking to make a connection with ease, you need to be let on to the secret. 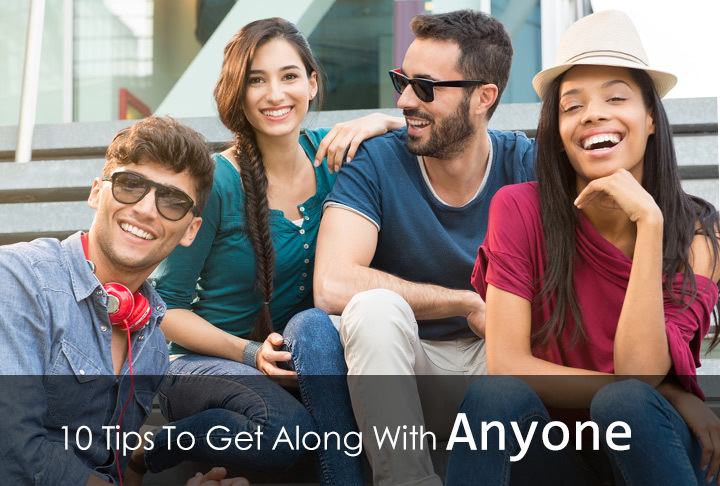 Here are 10 tips to get along with anyone. Be positive: This is the most important aspect that governs your personality. Everyone loves a cheerful smile and a positive word. Thus, stay positive and as they say, good things happen. You make friends faster when you are a happy person, so stay positive. Believe the best: when you think and believe that the best is going to happen, it does because you stay hopeful and positive. It helps you stay open to new ideas and relationships. Make the person feel good:Let your date or any other person feel good about themselves. Encourage them, complement them or even a smile can encourage the other person to open up about their life and talk with you with ease. Ask questions about him/her:It is best to know someone when you show interest and start a conversation by asking questions. You can talk about likes and dislikes, career moves, future plans and so much more. Complement them: Start the conversation and then complement him/her about the attire or how good they look. Maybe it is something else that catches your fancy, but make sure that you leave a good impression. Show sincere interest: Don’t fake your smile or interest, as most people are smart enough to catch it. Be sincere and stay honest right from the start. Be interested in knowing more about the other person. Find common ground:Most people have interest in reading, music, traveling and more, so gently question so that you find something that becomes a common ground to break the ice. Be a good listener: It is important to be a better listener than constantly talking about your own self. Listen to her/him, pay attention and ask leading questions so you get to know more about the person you want to cultivate a relationship with or just want to know more. Be fully present:Listen and pay attention, talk and smile but don’t be wrapped up in your gadgets. Nobody wants to have a conversation when you are busy chatting with someone on the phone or playing a game. Be there 100%. Keep the conversation light: Don’t lecture or just talk about the weather. Tell a funny story, joke around or even slightly flirt but keep the conversation going.